Jesus said in Matthew 19 (verses 4 & 5b), “Have you not read that He who created them from the beginning made them male and female . . . and the two shall become one flesh?” This is a formula that only makes sense in the power of God! God created each of us uniquely “man” or “woman,” yet brings husband and wife together as “one” in marriage – Coupled in Christ! What does this look like in your marriage now? What does Jesus have to say? What did He model for us? This will be our journey at this year’s retreat. There will be lots to laugh about and celebrate as we gather together Connecting, Caring, and Sharing in Christ! 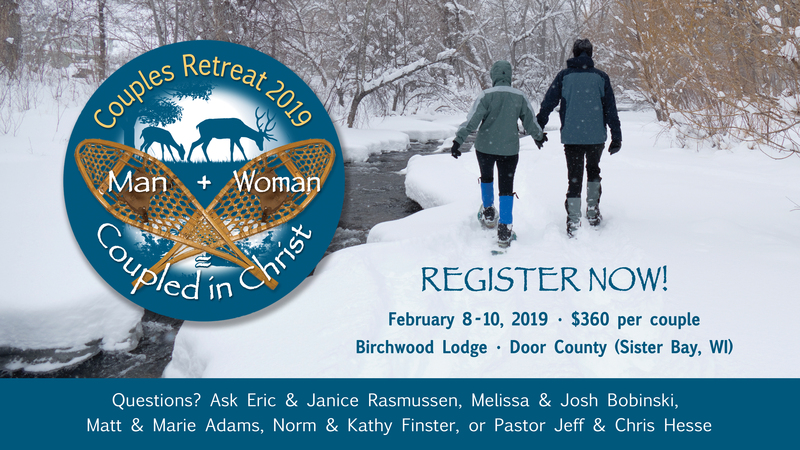 The St. John’s Couple’s Retreat will help you take time to relax together, away from the stresses and strains of life, and reconnect you with the love and joy from the first moments of your marriage. At the center of the weekend is study and application of God’s Word, and fun, lots of fun! Check out the video below from the Retreat Committee as we tried to have a little fun with this year’s theme.